I haven’t been a big brother since my little brother’s death in the summer of 1982. But I am like a big brother to my brother-in-law, Joel, though he is only ten months younger than me. Joel anxiously waited for me to take him as I promised to the new James Bond movie, Quantum of Solace, on his 51st birthday and to a Detroit Lions football game four days later. I hoped for myself to simply escape the fear that is paralyzing my hometown and be in the moment completely, lost in the thrilling fantasies of a new Bond movie and a football game. 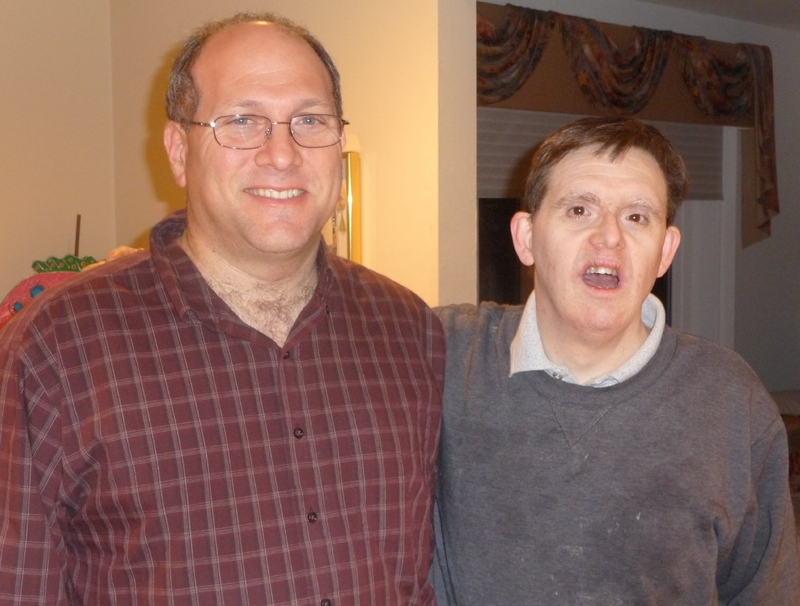 Although Joel is 51 years old, he gets excited when he knows that he is going to a new movie or sports game. His favorite things in life are James Bond movies, soap operas, Detroit sports teams, Passover Seders, schedules, bowling, cartoons, and spending time with me, not necessarily in that order. Last year on his 50th birthday, he slept over my house and I took the day off work to spend it with him. We watched two DVD movies, his three favorite soap operas, went bowling, and hung out together. This year, I bought tickets so I could take him to see the Lions play the Tampa Bay Buccaneers. Even though the Lions lost their first ten games in a row, Joel still believed the Lions had a mathematical chance to be the Wild Card team and eventually make the Super Bowl. I didn’t have the heart to tell him they won’t but he wouldn’t have accepted it anyways. He is the eternal optimist, having faith that Detroit will win, sooner or later. He doesn’t worry what is happening to the Detroit automakers. He is not concerned that our town and state are going through an economic meltdown unlike any in his 51 years of life. Detroit is weighed down by a heaviness of fear while its last mayor sits in jail. The unemployment rate in the city and state is the highest in the country. The thousands who are employed in the automotive industry or dependent on it are worried if they will have jobs next year. 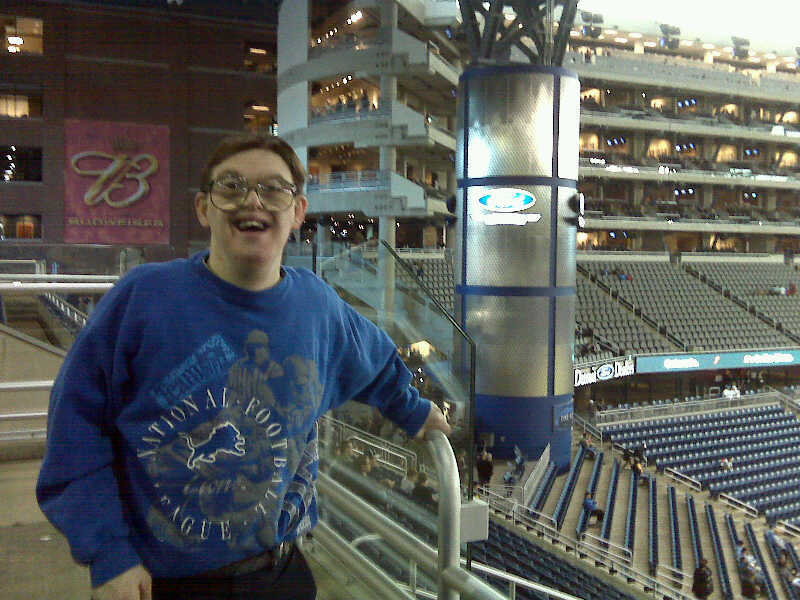 Fifty-one years ago, when Detroit was “The Motor City,” Joel was born with 47 chromosomes instead of the usual 46. The National Association for Down Syndrome claims the average life expectancy of a person with Down syndrome is 55 years. So for me, each birthday with Joel is an important day to celebrate his life and forget mine. I was hoping to escape from my reality and celebrate with Joel and his movie and sports fantasies. He has seen every Bond movie and was enthralled by the intense action of the newest though his favorite part was the familiar image and music at the end. On the day of the football game, Joel was excited to see the Detroit Tiger statue as we walked on the side of Comerica Park. There, we stopped to see the sprawling green baseball field through the gates and viewed an exhibit in front of us, featuring two legends from Detroit’s glory years, Hank Greenberg and Al Kaline. I wanted to believe in a miracle finish. I also want to believe that Detroit automakers will get a bridge loan that will allow them to return to respectability and profitability and pay the federal government back with interest. I want to believe that we in the Detroit area can always win but I know that very few real-life stories end with happy fairy-tale endings. I learned that painful lesson on a hot July night in 1982 after my father took his youngest son to a Detroit Tigers baseball game. On the way home, less than a mile from their house, my father’s car was side-swiped by another, sending both my father and my little 13-year-old brother to the emergency room. When my brother died after midnight, I lost faith in fairy tales. I believed then that I would never be a big brother again. I was wrong. Even though I am only related because of my wife, I am truly Joel’s big brother. Without me, he wouldn’t go to any Detroit Tigers, Red Wings, Pistons, or Lions games. He looks forward to spending time with me and I look forward to getting swept away by his enthusiastic optimism. I realized when I sat in the upper deck of Ford Field that I had nearly forgotten what it feels like to forget the worries of adulthood by getting lost in a forgettable sports game. I had almost forgotten but have begun to slowly learn from a 51-year-old man with Down syndrome what it is to feel like a kid again.